CREB selectively controls learning-induced structural remodeling of neurons. Learn Mem. 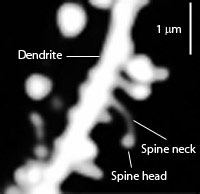 2012 Jul 18;19(8):330-6. doi: 10.1101/lm.025817.112. Middei S, Spalloni A, Longone P, Pittenger C, O’Mara SM, Marie H, Ammassari-Teule M.
The modulation of synaptic strength associated with learning is post-synaptically regulated by changes in density and shape of dendritic spines. The transcription factor CREB (cAMP response element binding protein) is required for memory formation and in vitro dendritic spine rearrangements, but its role in learning-induced remodeling of neurons remains elusive. Using transgenic mice conditionally expressing a dominant-negative CREB (CREBS133A: mCREB) mutant, we found that inhibiting CREB function does not alter spine density, spine morphology, and levels of polymerized actin in naive CA1 neurons. CREB inhibition, however, impaired contextual fear conditioning and produced a learning-induced collapse of spines associated with a blockade of learning-dependent increase in actin polymerization. Blocking mCREB expression with doxycycline rescued memory and restored a normal pattern of learning-induced spines, demonstrating that CREB controls structural adaptations of neurons selectively involved in memory formation.